A growing cooperation between the public and private sectors indicates that the tasks of redevelopment are too large and complex for either sector to accomplish alone. Some people maintain that government can do few things right; others are equally distrustful of the private sector. As used here, the private sector is considered to be all that is not government. 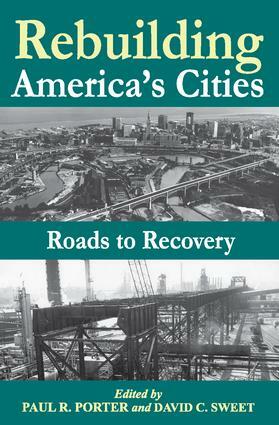 Each of the success stories illustrated is, in part, a ""road to recovery,"" although none appear to have been influenced by a purpose that broad.Paul R. Porter and David C. Sweet present stories of progress in self-reliance that concern neighborhood and downtown recoveries, school improvement, job generation, a regained fiscal solvency, novel financing techniques, helping tenants to become homeowners, and a successful venture in self-help and tenant management in crime-infested neighborhoods. The successes stem from the diverse community roles of Yale University, a medical center, the world's largest research organization, the Clorox Company, a gas company, an insurance company, a newspaper, neighborhood and downtown organizations, city governments and two religious organizations - the Mormon Church and the tiny Church of the Savior.These stories are located throughout the United States, including Akron, Baltimore, Brooklyn, Cincinnati, Cleveland, Columbus, Fort Wayne, Indianapolis, Milwaukee, New Haven, Oakland, Pittsburgh, St. Louis, St. Paul, Salt Lake City, Springfield, Mass., Tampa, and Washington, D.C. The editors have gathered the work of professionals known in the field of urban studies: James W. Rouse, Donald E. Lasater, Rolf Goetze, Dale F. Bertsch, Joel Lieske, Eugene H. Methvin, James E. Kunde, T. Michael Smith, Robert Mier, Carol Davidow, Jay Chatterjee, June Manning Thomas, Norman Krumholz, Larry C. Ledebur, and Robert C. Holland. But Are They Successes of the Right Kind?